We’ve all heard of SEO, right? But what is it exactly and why is it important to you? Search Engine Optimization, or SEO, optimizes your website’s content for search engines. What does that mean? It means that Google and other search engines can easily index your content, categorize your pages based on their content and then make those pages available for people searching for your specific content. SEO is important because you want people to easily find your content, product or service. For marketers, this is an ideal way to bring new prospects into your marketing funnel who may not know about your brand. If you’re not optimizing for search, you’re doing your content and your potential readers and customers a disservice. So, how do you make sure your page appears at the top of that search result? First, your content must be high-quality—there’s no fooling Google and its algorithms. Two ways to ensure first-rate content are length and freshness. Well-researched content around 2.5K words impresses Google and gets you a top spot in the search engine results page or SERP. Consistently updating your site with fresh content also is key. A good rule of thumb is to post new content at least once a week to avoid appearing stale to Google. Now, let’s dive into four simple tips to help you improve SEO for your site. Keywords—words or short phrases that show up in popular search queries—are a piece of the SEO pie, although keywords alone are not enough to boost results. If you’re missing high-quality content, it doesn’t matter how many keywords you have. Keywords are handy when determining what to write about. 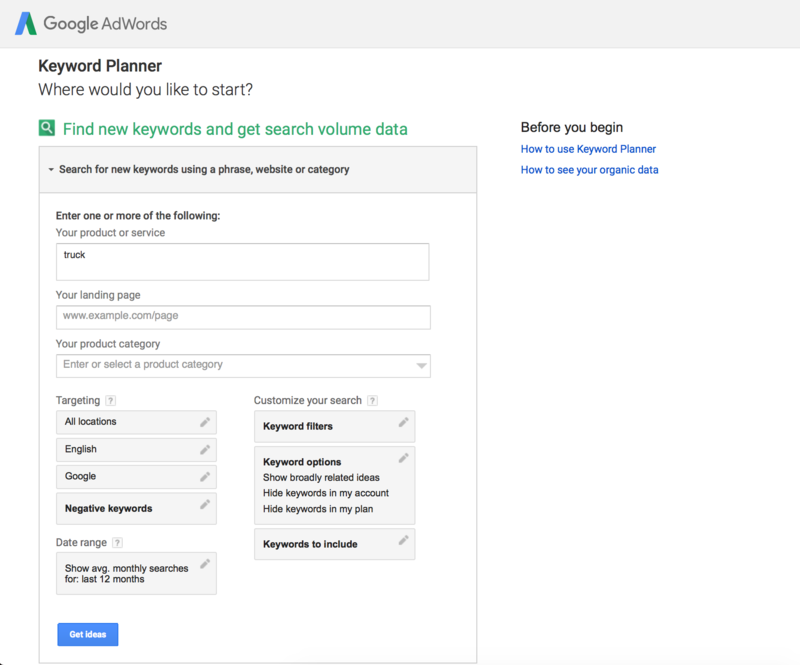 With a keyword search, you discover which words are likely to drive traffic to your site. Build your high-quality content around these keywords; don’t just sprinkle them into subpar content no one cares about. 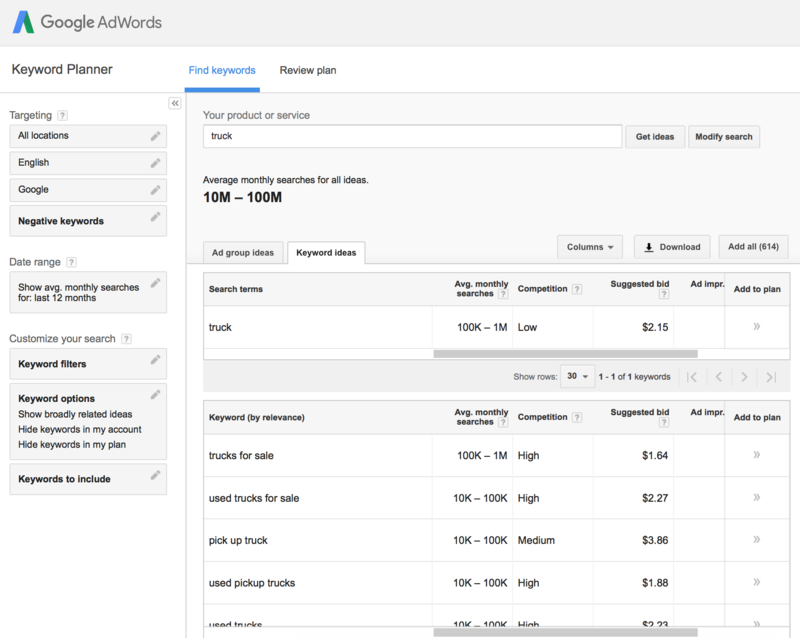 Google’s Keyword Planner is a great resource to get you started (see the keyword example for “truck” below). Next up: the title tag. This is the actual title of your page or article. Why do these matter for SEO? The title tag is what appears on SERPs, at the top of your page in your browser, and when you share your page on social media. This is critical not only for SEO but also for the user experience. Make sure those title tags are accurate and pithy. Put your keywords toward the beginning of the title tag. Keep your title tag between 50-60 characters. Finally, resist the urge to reuse the same title tag for multiple pages on your website. If you have two pages with similar content, either combine them into one page or get creative and differentiate the content, including those title tags. 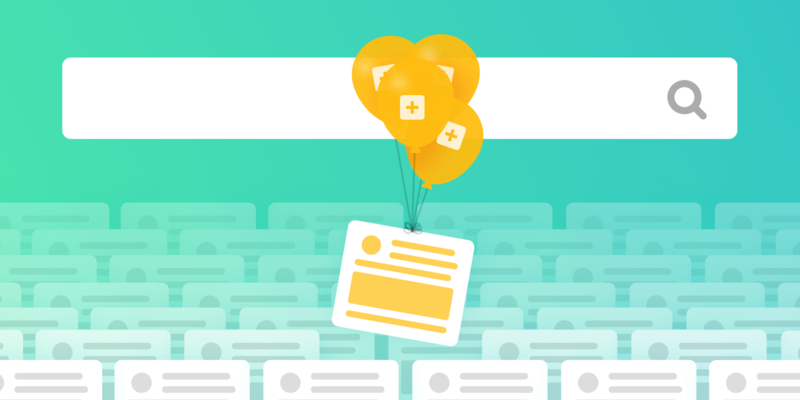 Meta descriptions and snippets, anyone? Another smart way to help your SEO is to write a solid meta description that shows up as a snippet beneath your title tag on a SERP. This snippet is simply a brief summary of your page so users can preview your content. If Google decides your description is pertinent to the user’s query, your meta description shows up as a snippet along with a short page summary beneath the title tag. If you don’t write your own meta description, Google will display a snippet based on the content that’s on your page. Always use high-quality keywords in your meta description so those words are highlighted by the search engine in the snippet. This is an effective way to draw the user’s attention to your keywords, which results in a higher click-through rate to your content. The final SEO tip is to include both internal and external links on your website. Internal links connect one page of your site to another page. Think of the “Contact us” link on websites. Internal links allow users to navigate seamlessly throughout your site. The external link is one that directs users to a different, outside domain, which can be powerful if used correctly. The content found on the external link should emphasize that it is well-researched and contains respected sources. Sounds easy enough, but don’t go overboard with the links. Google divides the value of these links by the number of links on the page, meaning the value of one link among many is diluted. So, while linking is valuable to SEO, be judicious in what you call to Google’s attention. Earning backlinks that point to your website is a huge win for SEO. Backlinks give a signal to search engines that your page has valuable content, which can boost your rankings, especially if it’s a popular site that links to your page. A tool like Open Site Explorer can help you research backlinks and find link-building opportunities. Now that you’ve got four practical tips to improve SEO, begin employing these strategies today to create high-quality content and drive traffic to your site through search. And boost your on-site engagement with our Related Posts tool, which recommends content not only by what’s popular but also what’s most relevant to your website visitors. Go create some amazing content we can all find!